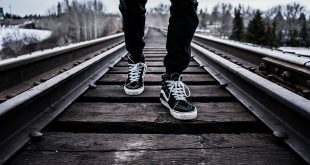 Ideally, you should have a unique complex password for each site but obviously, it’s almost impossible to remember a dozen of complex passwords. That said, using a password manager is a better compromise than using simple or re-using passwords. To make matters worse, some services like banking sites require you to regularly change the password to keep your account secure and safe. To deal with all this, most of us use a password manager like LastPass to better manage all our online and offline accounts. Why LastPass Alternatives? What changed? When we talked about what are password manager, we recommend LastPass to beginners. It’s easy to get started and their free version used to provide more functionality than the paid alternative. 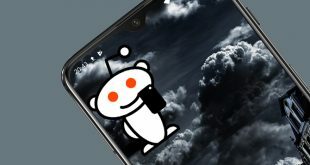 However, recently the company has decided to double the prices (from $1 to $2 per month) and some features (like unlimited sharing and emergency access) are also being taken away from the free plan. This, coupled with the security issues LastPass had few month back, has called for a better alternative. Best LastPass Alternatives for Android. If you are looking for a password manager then might have come across KeePass, a free and open source application to manage password. In fact, KeePass is my first ever password manager. Though the official app is only available for Windows, there are many other unofficial builds and ports for other operating systems and mobile devices. 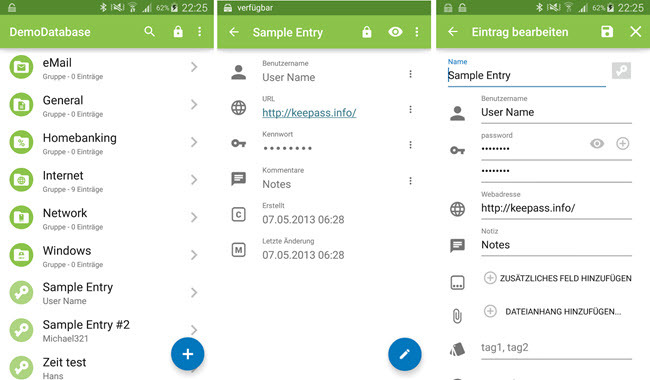 Keepass2Android is one such app that lets you create and manage all your KeePass passwords. The good thing about this app is that it is completely free and open-source. Features: The app is pretty minimal but has all the basic features like password generator, secure form-filling, cross-device sync using Dropbox and Google Drive, integrated soft keyboard to enter user credentials, support from custom fields, tags, and file attachments, a search function to quickly search for your accounts, etc. However, it lacks modern features like two-factor authentication and fingerprint unlock. Also, the auto-fill password doesn’t work well for all users. Dashlane is one of the most popular password managers with a simple, minimal, and good user interface. Besides from saving all your passwords, Dashlane can generate secure passwords and integrates with all your apps and browsers. Along with saving passwords, you can use Dashlane to securely store your credit card information so that you can fill it in apps and browses with just a single tap. All your information is encrypted with AES-256 crypto. 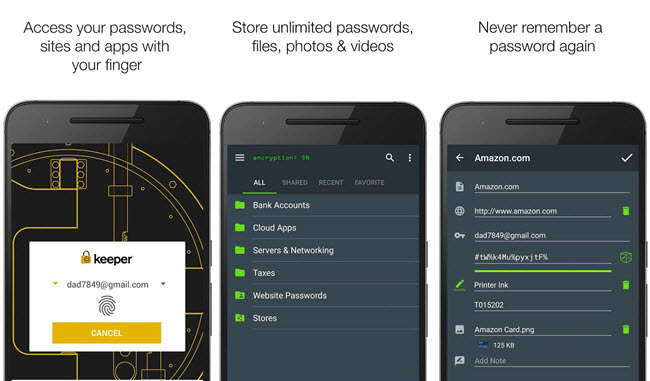 Features: Some of the features of Dashlane include but not limited to generating and saving passwords, share passwords safely, create secure notes, password history, mobile wallet to save credit card information, support for fingerprint unlock, compatibility with Google Authenticator app, cross-platform compatibility, etc. Price: Free for one device. You can choose between the premium plan and business plan which costs $3.33 per month and $4 per month respectively. What do you get with the premium version? With the premium version, you will get the ability to share and sync passwords across devices, secure account backup, support for two-factor authentication, and priority support. 1Password is very similar to Dashlane and is quite popular and loved among users. Just like Dashlane, all your passwords and account information is encrypted with AES-256 crypto. 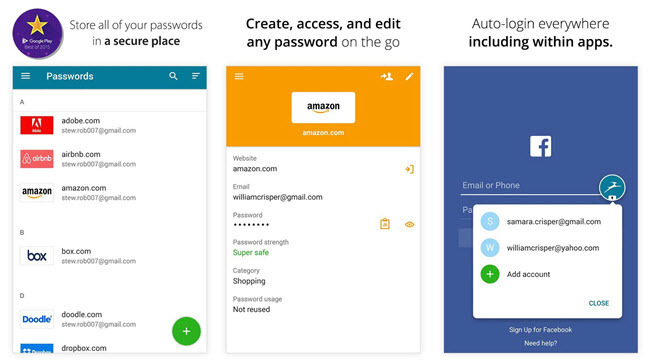 The app integrates and auto-fills passwords in all your apps and browsers with just a single tap. You can also sync passwords across all your devices. The best thing about 1Password is its travel mode which lets you remove sensitive data from all your devices when traveling. Features: 1Password supports fingerprint unlock, travel mode, ability to share passwords, generate complex and secure passwords, ability to create multiple vaults for different purposes, securely store credit card information, cross-platform compatibility, etc. Price: The primary plan starts at $2.99 per month billed annually. If you want to, you can choose the family plan that lets you share 1Password with five family members (including you) and costs $4.99 per month. You can add more members for $1 per person per month. What do you get with the premium version? Since there is no free version, you need to pay to use 1Password. However, you can try this app for 30-days for free. Of all the apps, Enpass has the best pricing structure if you are on a budget. You just pay a one-time fee and you are good to go. Enpass stores all your passwords locally and the database is encrypted with SQLCIPHER. So, other than you, no one has access to your passwords even in their encrypted state. As good as it is, the downside of Enpass Android app is that the free version only stores up to 20 passwords. Any more than 20 passwords, you need to purchase their premium plan. Features: Enpass is completely free for desktop users, auto-fills passwords in all apps and browsers, support fingerprint unlock, military-grade encryption, categorize your passwords, preset templates to properly store information, auto-clear clipboard, backup and restore over WiFi, etc. 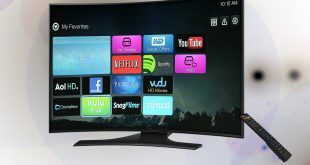 Price: The Free plan lets you store up to 20 items. If you want to store more, you can opt it the premium plan that costs a one-time fee of $9.99. What do you get with the premium version? 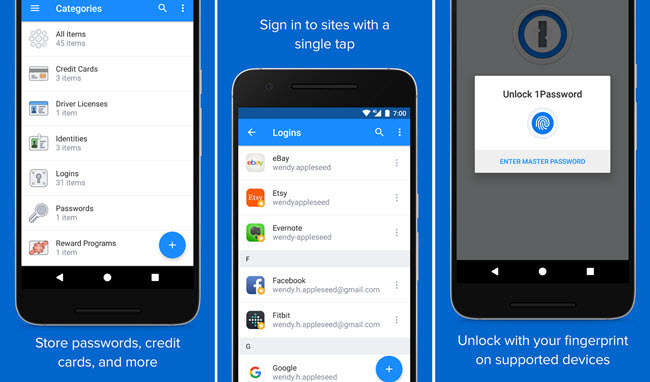 With the premium version, you can store an unlimited number of passwords on your Android device. 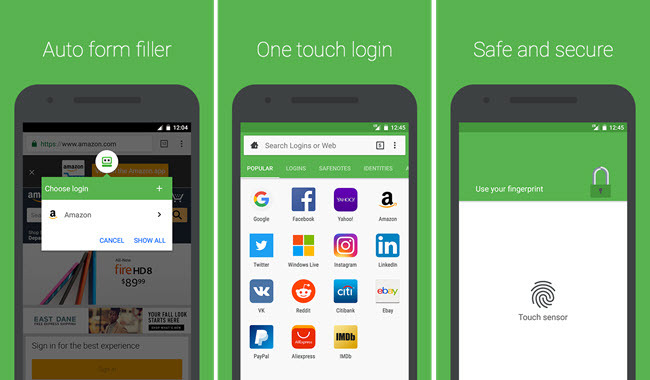 Keeper is yet another popular password manager for android with all the bells and whistles you’ll ever need. The base version is free for one device and you can store an unlimited number of passwords. Just like other password managers, all your passwords are encrypted with military-grade encryption and are stored locally. Apart from passwords, you can also use Keeper to store secure notes, photos, videos, credit card information, and other files. 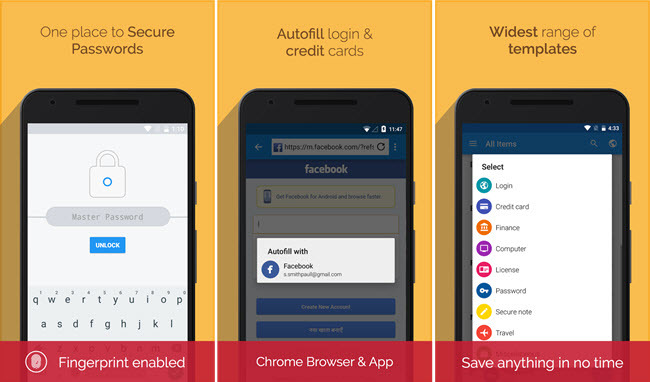 Features: supports quick fill for all apps and browsers, ability to give emergency access to your vault for up to 5 contacts, easy import and export, two-step verification, support for fingerprint unlock (only in pro version), hide and encrypt media files like photos and videos, support for Android ware, cross-platform compatibility, etc. Price: You can use Keeper for free on one device. To use it and sync it on multiple devices, you can upgrade to one of their premium plans for $29.99 per year or $59.99 per year. For businesses, Keeper charges $30 per user per year. What do you get with the premium version? With the premium version, you can share and sync passwords across all your devices, unlimited cloud storage backup, unlimited secure record sharing, 10GB secure file storage, and fingerprint login. RoboForm is one of the oldest password managers but it still is very relevant, active and does what it say pretty well. In fact, it integrates well with major browsers like Chrome, Firefox, and Dolphin. One of the best things about RoboForm is its Multi-step logins with “matching logins” feature. If you are already using LastPass then RoboForm can easily import all your passwords and other information from it with just a few clicks. Features: Sync data across all your devices, auto log into online account when using RoboForm’s embedded browser, autosave new login information, import passwords from all major password managers, password generator, auto fill web forms, built-in search feature, auto logoff or manual logoff, cross-platform compatibility, etc. Price: Free for one device. To use it and sync it on multiple devices you can choose between the “Everywhere” and “Family” plans which costs $19.95 per year and $39.99 per year respectively. The family plan lets you share RoboForm with five members including yourself. What do you get with the premium version? With the premium version, you can securely backup your account and access your passwords from any device. Hope that helps. Comment below to share your thoughts and experiences about using the above apps or if you think I missed any of your favorite LastPass alternatives for Android.